The Instituto de Nacional de Antropologia e Historia (INAH) announced last thursday that after four years of in depth analysis they have confirmed that the Xiximes were a cannibalistic group found within Mexico during the 15th century. Researchers argue that the eating of human flesh by this group was done during specific ritual times relating to the crop cycle of maize, hunting of deer, and warfare. The remains under investigation were found inside Maguey Cave on the Sierra de Durango mountains in northern Mexico. Of the 40 bones examined, the researchers observed that at least 80 percent had cut marks and signs of having been boiled. One important qualifier of this practice was that the Xiximes only ate the flesh of their own people. The goal was the appropriation of the soul of the individual, with the hands and head being the most important pieces. Determining that a group is cannibalistic is not a task that can be taken lightly. Given the nature of cannibalism and cultural prejudices, researchers need to be very explicit and have a wide range of evidence supporting their claims. The work done by the INAH is an exemplar of this. Their conclusion of cannibalistic activities among the Xiximes is well supported not just by osteological evidence, but also from the extensive ethnohistorical research that took place. In addition to archaeological work, the team looked through records from the 15th through 17th century from Spanish Conquistadors and Jesuit missionaries describing the Xiximes people. The goal of their research was to combine the archaeological and historical data in order to understand “the testimony of the Indians who lived around the year 1450, in houses built inside the caves… whose worldview was lost with evangelization… their activities were only known from letters drawn up by European missionaries in the Western cultural conception and the Catholic religion, regardless of what motivated the Xiximes to ‘feed the soul’ of another human” (INAH 2011). Historical sources make reference to the cannibalism of the Xiximes. Annual letters from the Jesuits in the early 17th century note these activities. 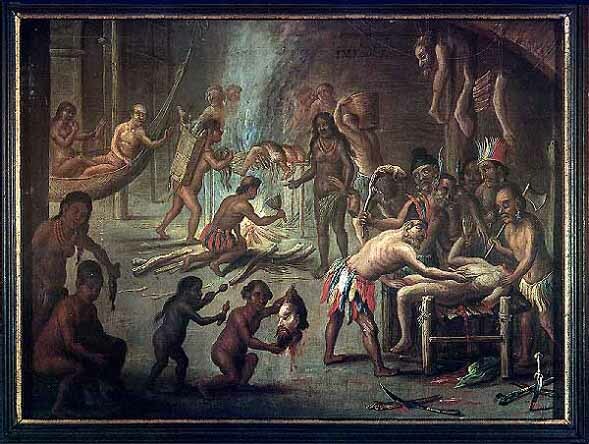 They described the Xiximes as fierce cannibals, responding to conversion to Christianity by killing and eating the missionaries. 17th century Spaniards noted the details of the ritual itself, stating that the ritual took place only before harvest, hunting or warfare. After winning a battle, they stated that “Upon returning to his village made ​​a very complex ritual involving the whole population, whose purpose was to ‘seize the soul’ of the other, by eating his body parts most valuable were the head and hands”. The merit of these claims has been questioned given a lack of archaeological information. However, the remains found at the cave show clear signs of processing for food argues the research team from the INAH. Sadly we are not given any indication what these ‘indicators’ consist of, nor are we privy to any photos of the remains themselves. We do know that the bones consisted primarily of joints and long bones, and that they had signs of boiling and cutmarks. Cannibalism is identified by a number of indicators in bioarchaeology (Villa et al. 1986): Evidence of cooking (including burnt bone and fragment end polishing, which is a result of cooking in course ceramic pots), dismemberment or butchery marks (similar to that seen on animal remains on the site if present), pattern of missing elements (post processing discard again similar to the treatment of animal bones), green-stick splintering of long bones. This facilitates the extraction and consumption of bone marrow (highly nutritious), cut marks, bone breakage, anvil and hammerstone abrasions, and significant number of missing vertebrae. The INAH reports that they have signs of cutmarks and boiling. Cutmarks indicative of cannibalism most often look similar to butchery marks on animal bones, showing removal of flesh and are found clustered around joints. Boiling is noted by pot polish marks. These are shiny areas that occur when bone is boiled in a pot and it constantly rubbing against the side. Cannibalism is often suspected, but rarely definitively proven. Given that the term often creates an emotional response it cannot be assigned without solid evidence. The INAH does a good job in combining archaeological and textual data in order to create their conclusions. Hopefully in the future we will see a full report that includes pictures and direct quotes from texts.